It’s easy to get assessments from PenStars. We use a cyclic process: you submit and get a score and feedback once per cycle. You can go around the cycle three times in total. 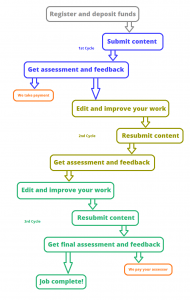 You submit content for assessment, starting the 1st cycle. You must have sufficient funds in your account to submit, even if you cancel (and recoup your money) before we assess. We assess your work to provide a quality score and feedback to help you improve. We take payment at this stage. That’s the end of the 1st cycle. You then have 3 days to edit and resubmit your content to start the 2nd cycle. We re-assess your work and again provide a score and feedback. That’s the end of the 2nd cycle. You then have another 3 days to resubmit for a final time, if you wish. You resubmit to start the 3rd cycle. We re-assess and provide a final score and feedback. The 3rd cycle ends and the job is complete. The editor who assessed your work gets paid at this stage. 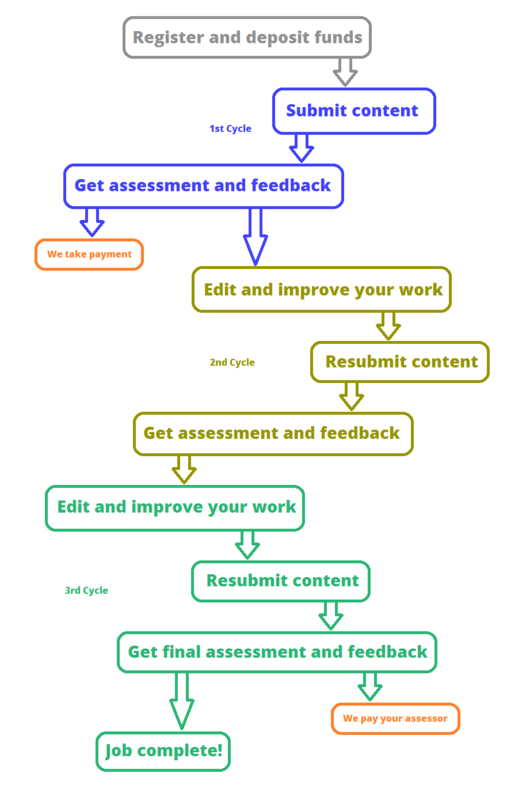 Please note that completed submissions are complete: our system does not allow us to pull work back into the assessment cycle for a “second chance”. That’s why we give you three full days to edit and submit every cycle. Don’t miss your deadlines!